Undoubtedly, the call center industry is one of the strongest pillars in the Philippine Business Process Outsourcing (BPO) industry which highlighted the Philippines in the world economic map. But did you know when call centers significantly started in the Philippines? It actually started with Sykes in Manila back in 1997. They were the pioneer in the call-center industry after opening their first branch in Makati with a handful of employees. In 2003, they were also the first call center company to operate in Cebu. As a global company, Sykes have clients in Asia Pacific, Middle East and North America, serving Fortune 500 Companies. With Filipino’s proficiency with the English language, it wasn’t a surprise that the industry flourished; and the rest was history. The last graduation season was just three months ago. There’s still a large number of fresh graduates who are looking for jobs. If you are one of them, you can check out Sykes E-Recruitment website at http://bit.ly/SykesCareersPH which enables job seekers to practically apply faster and easier. In today’s modern society and advanced technology, information is not only in our fingertips, doing things are also as easy as the snap of a finger. From messaging a friend to buying items online, from sending emails to transferring virtual money, we can do all those with the click of a mouse or a touch of a button in our smartphones. With the development of technology and processes, Sykes Philippines has leveled-up their recruitment by bringing it online with Sykes E-Recruitment. The website features a fast application process where you can apply in three different ways from which you could choose from depending on your situation and needs. First, you can simply sign up and wait for an interview call. Second (and faster), you can immediately schedule for a face to face interview. And lastly (fastest), schedule a Video Call interview within the same day. Fast: Create your profile now and we’ll call you at your preferred time. Faster: Schedule your interview NOW! Fastest: Get interviewed today via video call! Add to that a “Live Chat” assistance feature in the website which is open from Monday-Friday, 11:00 am – 8:00 pm. Nature of support jobs include the industries of Health, Finanace, CSR, Back-Office, Technical Support Represntative (TSR), and Telecom. The other day, I heard in the news that the unemployment rate went down from 7.8% at the same time in 2013 to 7.0% this year. 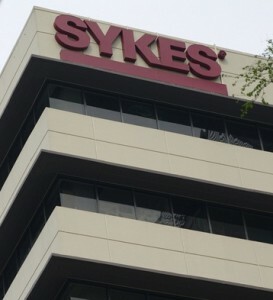 Sykes alone currently has at least 15,000 employees and growing. That’s good news isn’t it? And with the country’s booming economy, don’t let this opportunity pass. Grab the chance to give your career a boost and apply via the Sykes E-Recruitment Site. Apply through Sykes E-Recruitment Site and get hired fast! This entry was posted in Gambit, Service, Website and tagged Online Job Application, Sykes, Sykes E-Recruitment, Sykes ERecruitment, Sykes Job Application, Sykes Philippines. Bookmark the permalink. Sykes has been here in the Philippine call center industry as far as I can remember.